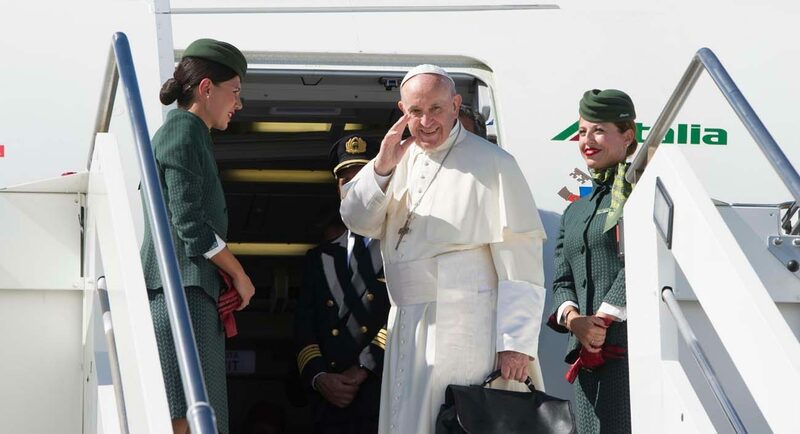 UPDATED – ABOARD THE PAPAL FLIGHT TO COLOMBIA (CNS) — Flying to Colombia, with a flight plan changed to avoid Hurricane Irma in the Caribbean Sea, Pope Francis told reporters that Colombia and its neighbor, Venezuela, were in his prayers. Venezuela, Colombia’s eastern neighbor, has been the scene of protests and severe shortages of food and medicine for months as Maduro has tried to consolidate his power and rewrite the nation’s constitution. More than 100 people have died in the protests since April. Alitalia’s original plan for the more than 12-hour flight to Colombia was to cross the Atlantic, then fly over U.S. territorial waters and Puerto Rico, the Antilles and Venezuela before landing in Bogota, Colombia. As the flight was about to take off, Vatican officials said there had been a change of plans because of Hurricane Irma. The motto of the pope’s visit, “Let’s take the first step,” purposefully uses the plural because “everyone must feel involved in this process, this itinerary, and concretely translate it” into action, the cardinal told L’Osservatore Romano, the Vatican newspaper. God bless Latin America, the continent and its people with peace and love.